Michael Amaya, B.S. in Public Health, was featured in NIU President Lisa Freeman’s Undergraduate School Commencement address December 2017. 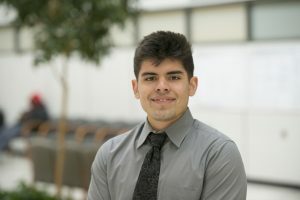 Michael Amaya is not unlike many NIU Public Health students. He worked exceptionally hard to get to graduation day December 2017 where he was featured in NIU President Lisa Freeman’s commencement address. Amaya worked summer jobs and saved up for five years so he could transfer from community college to NIU. All the while, he continued to provide support to his parents, both of who battle from chronic illnesses. His experiences with his parents’ health sparked a desire to figure out why people develop illnesses. He set his sights on a career conducting research as an epidemiologist, and chose NIU because of our strong public health degree program. Knowing he wanted to pursue a master’s degree in epidemiology, Mike kept his grades up. He made the dean’s list each semester. He coauthored a developing study regarding prenatal exposure to acetaminophen and child behavior outcomes. Academic rigors did not stop him from immersing himself in the NIU community. He was an active participant in our Student health Organization where he earned an outstanding contributions award for assisting in blood drives, writing gift letters to seniors, and volunteering at Feed My Starving Children. He also served as a student representative for our public health advisory committee. He still found time to successfully complete an environmental health internship with the village of Arlington Heights. He was also a research assistant for the Quality Payment Program of Illinois, and Healthy Hearts in the Heartland. His professors said he not only embodies the highest quality of student in the classroom, but has an exceptional attitude and served the NIU community generously with his time pride.